I’ve seen pictures that remind me of Christmas back home. Decorated trees and holiday party pictures show up on Facebook. Retail catalogs appear in my seasonally active inbox, where shopping sometimes happens. The home in Newtown, CT, was dressed with garlands and bows. Scenes of snow falling on branches, dogs bounding through snowy yards, and tales of traffic jams remind me of the holidays. Not that we’re out of season here in Cantabria, Spain. Christmas is upon us, places are closing for the next month, and in the cities people are drawn to special markets, massive nativity scenes, and concerts. But we are observers of a much subtler season. 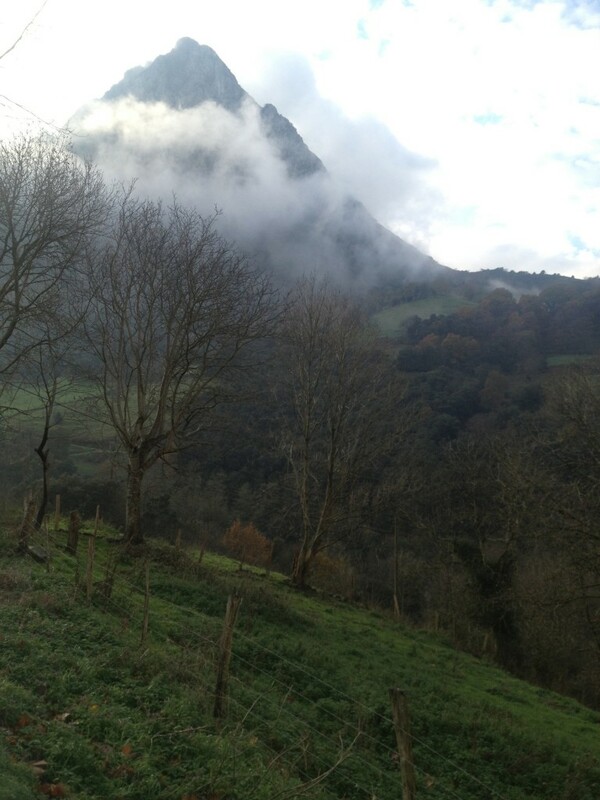 We’re in the country, outside of the village that is outside of the town that is about 15 miles from the entrance to the A-8 highway, which is around 45 miles from Bilbao or Santander. (Note, however, that we are much less isolated than in that house within an English ‘country club’ neighborhood in Murcia.) With the use of a car – a 4×4 Nissan truck, actually – we’ve made the trip into town and neighboring villages a couple times a week. The turn-off to our house in La Sota takes us along a one-lane, curvy ascent to the next drive, which serves a couple tiny pueblos, to the next fork, which approaches our house and three others. Between Ramales de la Victoria and our place, about 5 miles, we’ve already crossed the Rio Asón several times. The river is riding high over the banks and up the trees, shallow and fast. When we first see our house across the small pasture in front, we are beside a quick stream just a few feet wide, a gurgling fountain we can cross on foot if we find the right spot. And around us, in every direction, are hills and mountains, rising from our 200-some meter altitude (700 feet) to the peaks of 900 – 1200 meters (3-4,000 feet). We’ve walked up to the next two villages, and down the valley trail part way for a variety of views. The mountains are patched with pastures mixed with woods and rocks, steep clearings for hungry, agile herds. Near the top, trees are scarce and the rocky cliffs and summit are sometimes spotted with snow. The sheep barn we drive by has produced about a dozen lambs since our arrival two weeks ago. Today, they’ve left their mothers for a group romp around the herd, sweeping away from the nucleus while holding a close orbit. We see oaks, pines, and eucalyptus, chestnuts and walnuts, fruit trees, wild vines, prickly blackberries, and shiny holly. It smells of spring, fall, and winter at once. Out on the main road, a section of eucalyptus was apparently harvested. Whether we look to the near ridge or the higher hills, we see sheep, sometimes goats, always dogs. The clinking of bells on the goats or sheep is constant, broken infrequently by the clucking of chickens. Apart from our own, we’ve spotted a couple other Arabian horses. 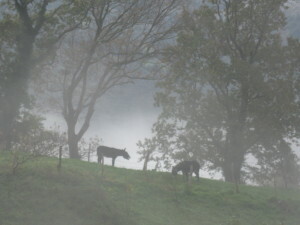 Three donkeys live in the neighborhood, and we can’t help laugh at their unimaginably loud brays. Overhead are hawks and vultures. Blackbirds and songbirds dart around the pasture and stable. Some of the branches are bare now, but oak and chestnut trees are holding on to their brassy leaves. The landscape’s aspect changes constantly, suddenly or sometimes slowly, almost imperceptibly, when the sun comes out or the fog drifts up from the valley or the clouds blow over the mountains. We are just one little range from the Cantabrian Sea. The distances seem great and small. Our place can be noisy, even inside, with wild wind and rain. Or it can be quiet in the morning fog or in the mauve sunset and blue hues of early darkness. The horses are fed and tended now, at 6:30 p.m.. It’s already night, and we are still a couple hours from dinner. It’s not sparsely populated around here. Along the valley there might be a village every five or so miles. But there are considerable tracks of land that are without roads or homes, up around the peaks and on the rocky verticals. Even these sections are crisscrossed with footpaths that have been used for centuries to connect the two sides of a mountain, for the herds, and for the walkers and hikers. These days, the walkers are generally old men, sometimes alone, sometimes with a son or friend, working their way slowly with a walking stick and perhaps a dog. 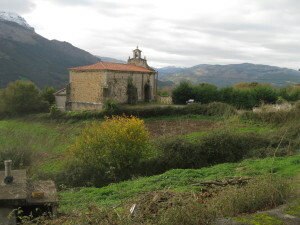 The church in Mentera, an easy walk from here. Boulders and stones from the hills have worked their way into country and village homes. One of the stable walls here is an outcropping. The walls of this house and most homes and barns in the neighborhood are rough stone patched together. In small villages, some dwellings are still confined to the upper story while the animals are sheltered below. Fields and yards are divided by barbed wire or stone fences. Walled cemeteries are filled with crypts holding neat rows of family members under one roof. Church yards double as public squares and scenic overlooks. Nearby villages are busy with coffee shops and bars, feed stores and supermarkets, auto shops and building suppliers. Cars park wherever they can, and women gather at the bakery or butcher shop. The pueblos seem to exist to support the outlying areas, rather than the other way around. 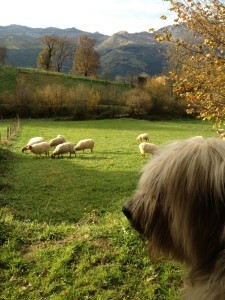 When we go to town, we are always anxious to get back home to our dog and horses and our own spot in the hills of Cantabria. This scenery may not reflect our traditional Christmas images. But these sensory wonders recall the season nonetheless.